Throughout next few posts we will learn many aspects of ready-mix concrete. We have more or less idea about water demand of concrete. We have already discussed about water measurement, water quality for concrete construction according to ASTM and ACI code. The minimum water demand is found at intermediate (300 kg/m3) cement content depending on characteristics of aggregate and cement. 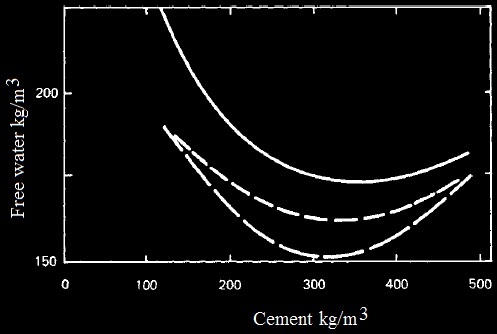 As cement content in concrete determines strength & durability, the minimum value and respective cement content has no technical significance. But this minimum value guides us to check cement content whether lies more or less near corresponding lowest free water demand. Another factor that control water demand, though less significant, is fine aggregate to coarse aggregate ratio. Generally it becomes significant when the ratio is very high relative to optimum value. High ambient temperature and temperature of materials increase water demand of mix. It is found in recent tests conducted in united states that for a rise in 170C temperature demands (2-6)% rise in water demand which leads an increase of < 5kg/m3 cement content. In UK, with increased water demand, for a given slump and strength, cement content is not effected significantly. 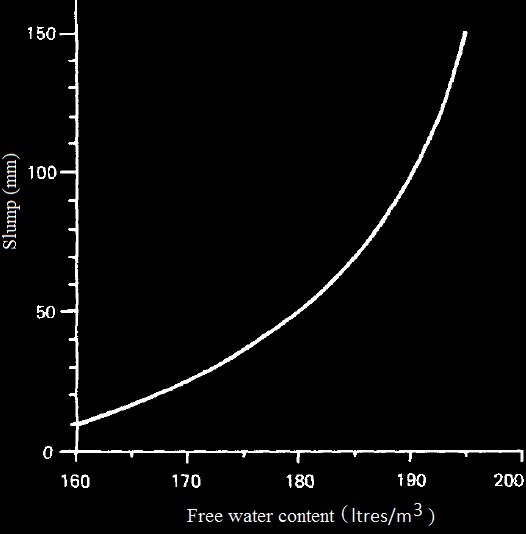 Relation between slump (workability) and water content is shown in following figure. This relation is independent comprehensively on cement content, whereas workability and water/cement ratio are not independent of cement content. Following figure provides a clear description of this relation. There have also influence of transportation and time which we will learn in next post. There will learn about rate at which workability of concrete mix is changed; till then good bye.